Not as visibly placed as the others, Child C has put his hands inside his pockets and there’s a rather strange and scary aura about him. It looks like he’s putting the blame on Child A but in a manner that is devoid of any morality or righteousness. He seems like the likely culprit to you because his whole body language says that he is the culprit but he knows that he won’t be blamed because everyone else thinks that its Child A. If your choice for the perpetrator is Child C because of the way he’s hiding behind the others and it looks like the verdict of the matter will be in his favour, you were born to be a leader of others. You care for the happiness of the others who surround you and you are the person they turn to when they need to make things right. Opinionated and charismatic, you’re ready to take the initiative in all situations. The ‘greatest happiness of the greatest number’ is what you strive for but not just for public good. At the same time, you’re also using the good you’re doing to gain more for your own self. A small girl dressed in blue, she’s holding on to her mom’s clothes as if she’s scared of the shards of the vase or of what will happen because it broke. 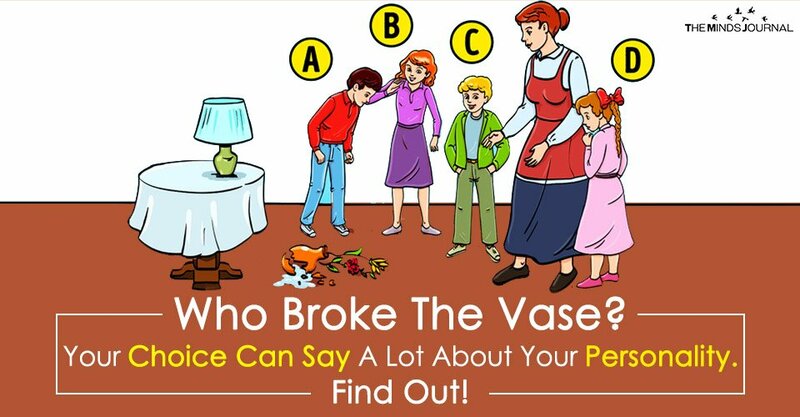 Besides the mom, she’s the only one whose eyes are fixed on the broken vase. Everyone else is looking at Child A who is looking at the floor guiltily. When you see her hiding behind her mom, you think that she’s the culprit and she’s hiding behind the person who is going to dole out the punishment in order to escape from her ire and the possible consequences. 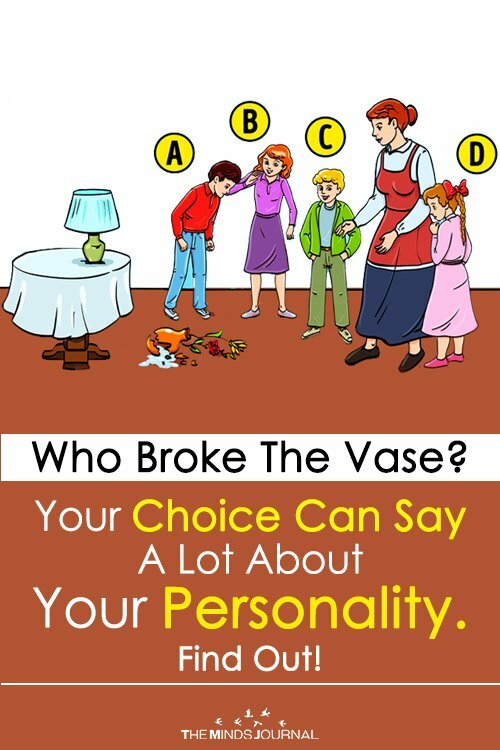 Looking at this through the eyes of a psychologist, it shows that you are sensible and dependable. Everything you take up is sure to be successful in the end. You genuinely try to improve yourself as a person and you work hard in order to succeed. Trusting others comes easily to you and your heightened sensitivity helps you understand people better. Others also find you an easy person to talk to because you listen to them carefully and they know you won’t let them down if they need you. As a result, you are unforgettable to everyone who meets you.